Feedback: 38 comments - leave yours! There is more than meets the eye to this cult Sicilian Sunday roast - a stunning highlight of any family meal. Today I bring you a cult Sicilian dish, delicious cousin of the British Sunday roast or the French Beef Carrot but uniquely Sicilian. You may think Sicily as a sun-drenched earty heaven, but it is first and foremost a place of poor and hard-working farmers who always had to make do with a scarcity of food. Meat, especially, was always rare, and Sicilian mamas excelled at using all sorts of tricks to make a tiny bit of meat go a long way. 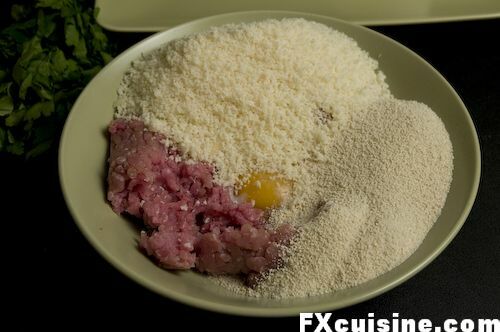 Falsomagro, also called Farsumagru, uses a small amount of premium veal cuts and stuffs it with a mixture of ground meat, breadcrumbs, ham, cheese and hard-boiled whole eggs that give its unique look when cut. Sometimes the true etymology of a word becomes so lost to most people that a new, popular etymology rewrites the word. In mainstream Italian, we call this falsomagro or false-lean or false-lent. Contemporary Italians wonder why. 'Because it looks lean but there is a lot inside' they venture. While there is certainly 'a lot inside', it does not look overly lean. 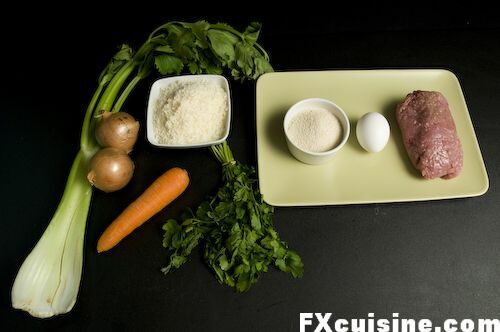 The recipe was apparently invented during the culinary reign of the Monsù, those French cooks who operated in wealthy Palermitan households starting with the Anjou rule. Others place it in the 15th century under the Spaniard rule. 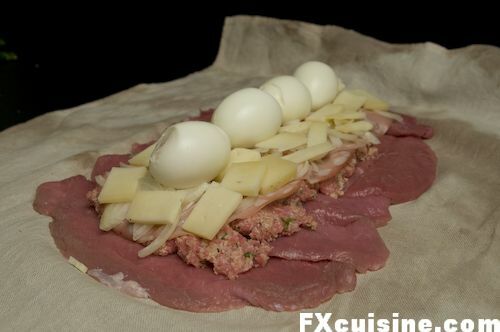 In any case, the original name meant 'lean meat stuffed', as the veal outside is lean (magro) and is stuffed (farci in French). 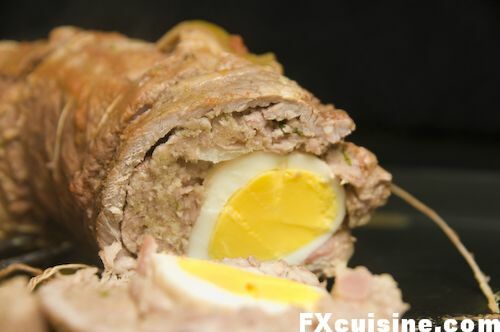 If it was 'farcie de maigre' - stuffed with lean stuffing - originally, it certainly no longer applies. The usual dialectal name is farsumagru was translated into falsomagro, but you might also encounter rollò, braciuluni, braciolone or brociolone. 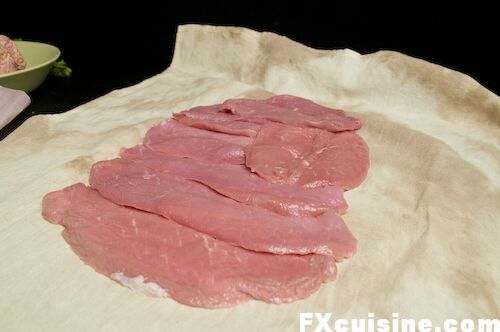 Traditionally bullock meat is used instead of veal, and the meat is fried in lard and not olive oil. Let's prepare the stuffing - clockwise from the bottom left: ground meat, ground parmesan or caciocavallo cheese, breadcrumbs and one egg. Mix with your bare hands. No mixer please, that would una mancanza di rispetto. ... and combine into a ball. Surprise, it holds together mostly thanks to the meat's cohesive power. Let's the fun begin. First make sure your guests are safely busy in the den and lock the kitchen, so that nobody will be able to barge in and catch you with an half-exploded falsomagro. Lay a clean kitchen towel on the table. I boiled this one a couple times with beef, carrots and a pig's foot, hence the color. The point is that it be clean and devoid of any detergent. 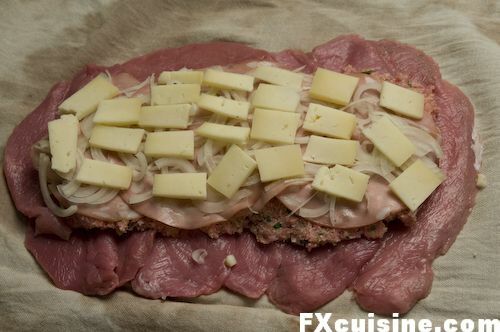 Carefully tile the veal slices so that they overlap a little. 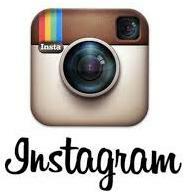 You should aim for a rectangular shape. If your butcher was lazy when he sliced the veal and your slices are too thick, hammer them with a kitchen cleaver held flat. 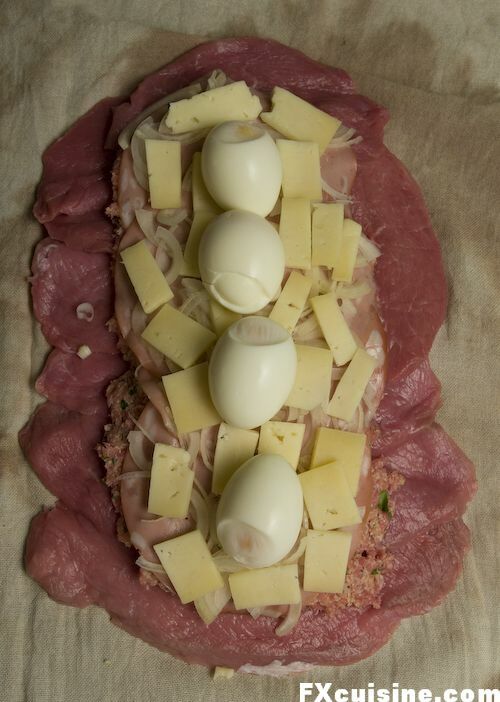 Don't be shy, this is a Palermitan recipe, per carità! 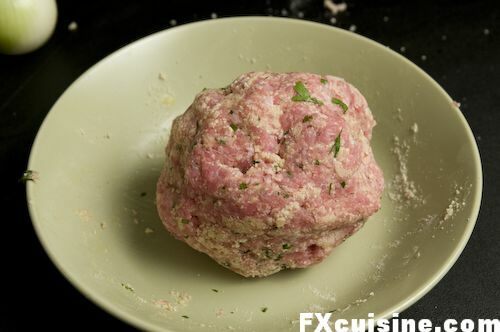 Spread the meat stuffing, leaving about 5cm/2'' on every side. 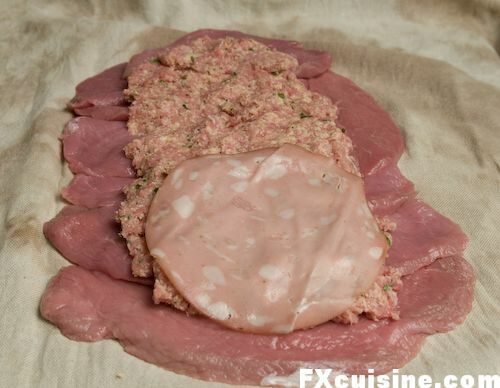 Covers with the salami or mortadella or ham slices. 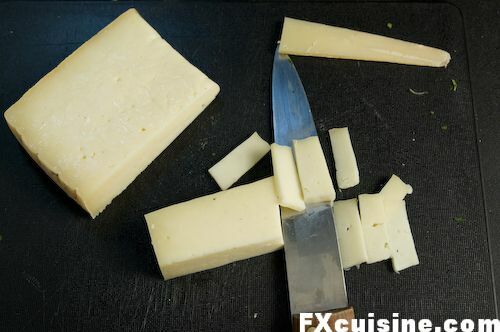 Let cut through the cheese - you need a full fat cheese that will melt nicely, such a young caciocavallo or fontina. 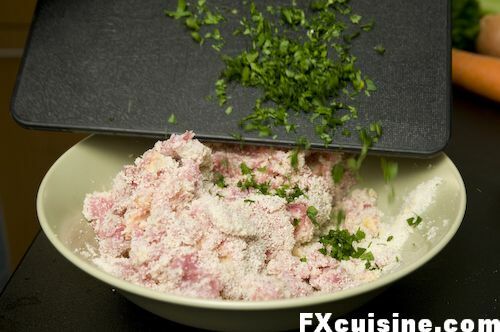 Spread one onion sliced thinly over the mortadella layer, then tile the cheese sticks on top. It sounds less and less magro (lean) as the layers go by. Now the hard boiled eggs. If you start sweating and wonder how the hell you're going to close your falsomagro, you won't be the first. But as the old Sicilian saying goes, 'You'll be amazed what can fit inside a farsumagru'.